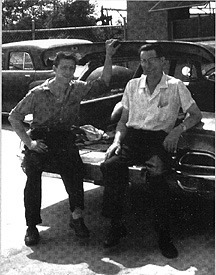 When Niklaus Friedrich (on the right in the photo along with Bob Friedrich) founded Friedrich Metal Products in 1950, he joined almost twenty years of experience in the sheet metal industry and an inventor's ingenuity to offer custom-built solutions to clients in the New York City area. Since that time, the company has continued to build on its commitment to strong customer service, excellence in workmanship, innovation and integrity. In 1985, Friedrich moved its home office to Greensboro, North Carolina to better provide manufacturing and delivery efficiencies to its customers. Today, Friedrich works with companies throughout the United States and Europe, providing quality component parts, custom fabricated equipment and products. Part of the attitude for success shared by every member of the Friedrich team is a dedication to customer service. When you need an answer for your unique situation, we deliver quick response whether from our customer service department, our engineers or administrative staff. That means same day shipment of parts you need to keep your operations going. Or strategies for innovative ways to solve operating problems going forward. With follow-up to make sure things continue to run smoothly. And always with a sensitivity to the economic realities, always working to find a way to do it better and more economically. The best of intentions is only successful when coupled with the right equipment, experience and expertise. At Friedrich Metal Products, our computerized machinery assures precision every time. Machine operators join their specifications knowledge with experience to deliver the most efficient procedures for every job. Designers apply both practical experience and the latest research to offer innovative solutions to each project. When you work with Friedrich Metal Products, you'll find a group committed to understanding your goals so the best approach for getting there can be developed. When you need a source to help turn your vision into reality, contact the company with an attitude for success. Friedrich Metal Products delivers solid solutions.